Ordered on Amazon and received your book a few days ago. Terrific job. I found myself laughing reading it, not just because of your cogent and witty writing, but also because I’m currently laboring away, 160,000 words into my big new book on Intel Corp — and I realized that you put more wisdom into a single tweet than I’ve been able to manage in 20 or 30 pages. You are truly one of Scouting’s treasures. 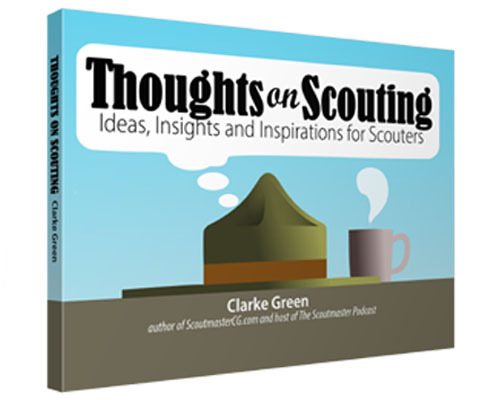 Just got your book “Thoughts on Scouting” and love it! It is right down my interest as short, simple ideas (tweets) that hold great value. Being a Scoutmaster with diagnosed ADHD (why I can think like an 11 year old), I am glued to it as I read and flip the pages. I see a lot of Scoutmaster Minutes in what you wrote, both for troops and for my role as a trainer of future Scoutmasters. I have been collecting different short passages like this for years and will be adding a few of yours to my collection. I often use them in training sessions. I feel the book would be an excellent suggestion for someone making the transition from Cub Scout leadership roles to becoming an adult leader in a Troop. The book does a really nice job of suggesting to the reader how the adult leader role in a Troop must be different in order for Boy Scouts to grow and thrive. If you care about someone involved in Scouting, a copy of this book would make a very meaningful gift. If you are a volunteer searching for brief, high impact statements to enhance training sessions or set the tone for meetings – you will find rich content here. If you are personally looking for some material to refresh or re-energize your commitment to serving youth through Scouting, you are going to love this book. I recently came back to Scouting and have been eagerly devouring Clarke Green’s numerous podcasts from scoutmastercg.com and heard about this book. I bought it to read while I was at the first half of the National Jamboree and might not have access to the podcasts. It was a quick read but I will read it over and over because the short blurbs on each page (tweets and nuggets from his blog) are the best kind of teaching and humor… succinct but substantive. The bits of wisdom (I’m tempted to call them Scouting Proverbs) are short and weighty; the humor is short with the flavor of real experience coming through. A very good book that I will read again and give as a gift to others in Scouting. I have a fondness for sayings, maxims, adages, mottoes, epigrams, proverbs, and aphorisms. There’s poetry and beauty in expressing a complex thought with a few well-chosen words. All of the thoughts in this book were first published as 140 character long ‘tweets’, it’s been great fun to watch them take on a life of their own. They are offered to get you thinking about your work in Scouting, and as a source of inspiration. I’ve based some of my Scoutmaster minutes on these thoughts and have used them to liven up training sessions. To keep things cheerful (and because I don’t take myself too terribly seriously) I’ve thrown in a joke or two. Since people do ask consider this my permission to republish anything in this book in newsletters or any similar communication that furthers the work of Scouting. All I ask is that you let folks know where you found it!